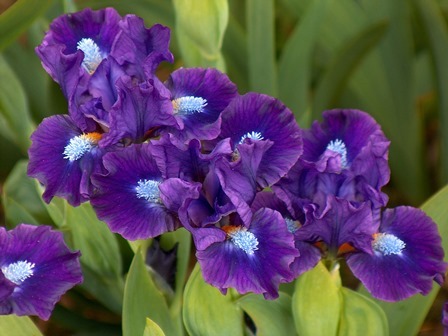 Greater Portland Iris Society invites you to our Bearded Iris Plant Sale, Saturday, August 19th, and Sunday August 20th. Both days are free to the public 9 AM to 4 PM, located at Portland Nursery, 5050 Stark Street, Portland OR. 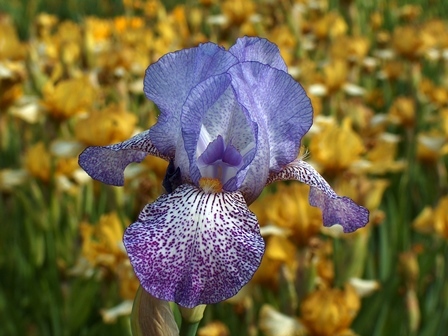 Bearded iris come in many colors and different sizes to fit everyone’s tastes and needs. At the bearded plant sale we will have all of the sizes available. Blooming early Spring, Miniature Dwarf from ground level to 8 inches tall are suitable for the rockery. Early to mid April blooms the Standard Dwarf at 8 inches to 16 inches forming tight little clumps with bright coloring. Intermediate and Border Bearded are both at 16 to 27.5 inches. What differentiates the two, Intermediates are to bloom earlier between the Standard Dwarf Bearded and the Tall Bearded, while the Border Bearded are to bloom with the Tall Bearded. 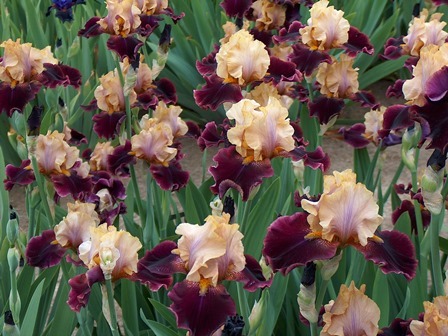 The largest of the classes of bearded and last to bloom in late May are the Tall Bearded. Standing 27.5 inches and taller, some as tall as 36 inches plus, they make large mass displays. A class that is fast becoming a public favorite due to the limited spaces of the city garden is the Miniature Tall Bearded. 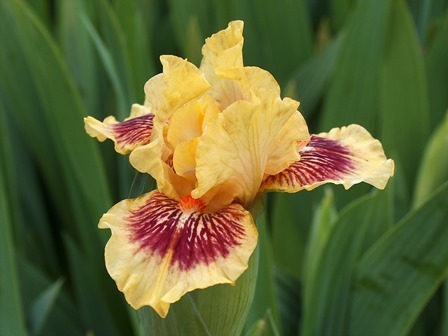 This class at 16 to 27.5 inches tall is easiest to describe by stating; A Miniature Tall Bearded iris is to the Tall Bearded like a Miniature Rose is to a Tea Rose. Both to be diminutive and in proportion with plant, stem, and bloom. These little gems of the garden start blooming slightly before the Tall Bearded season in mid May in the Portland area. 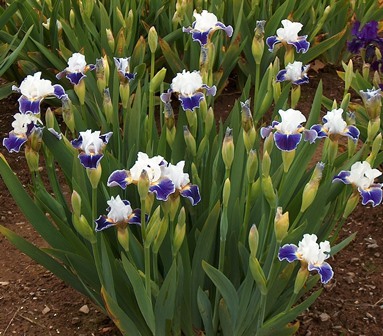 Photos following are representative of some classes, colors and flower forms found in the Bearded Classes. 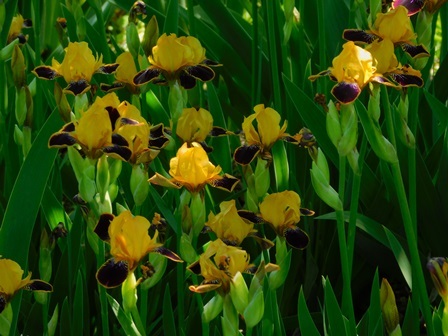 These individual irises may not be at the bearded plant sale. 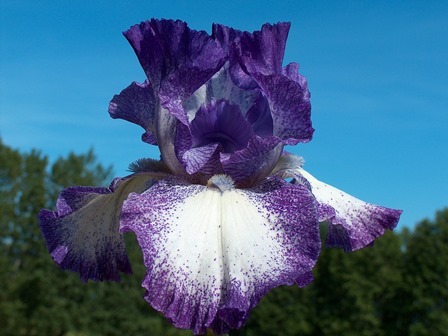 One of the earliest classes of the bearded iris to bloom is the Standard Dwarf Bearded (SDB). Here in the Greater Portland area you can expect color early to mid April. This plant has the habit of blooming in tight mounds. Intermediate Bearded (IB) bloom at knee height after the Standard Dwarf and before the Tall Bearded, early to late May for the Portland area. Miniature Tall Bearded (MTB) are smaller plants with well proportioned stems and blooms, great for the city garden. Tall Bearded the one iris that usually comes first to mind, are large and colorful, making for a grand floral display in the garden. Here in the Portland area expect the peak bloom late May for the Memorial Day weekend. 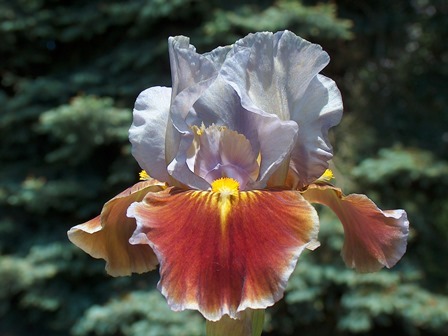 At the Bearded Plant Sale, club members of The Greater Portland Iris Society will be available to help with any questions regarding the family of iris (the Rainbow Goddess), culture with written literature, and hands on demonstrations. All plants will be well marked with names and photos for easy identification. Join us August 19th and August 20th at Portland Nursery 5050 Stark St. 9 AM to 4 PM to find that new treasure for your garden.